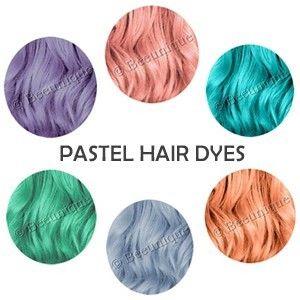 Pastel Hair Dye has seen a massive increase in sales recently due to the Pastel Hair Trend. Gone are the days when a ‘blue-rinse’ or pale pink hair was reserved for older ladies, and usually caused accidentally by over-toning! First thing to know is you must have very pale hair if you want a light colour to show up. Using a pale lilac on medium brown hair for example is not going to give you the desired pastel result. Pastel shades are best used on hair that is naturally light or has been bleached to a pale lemon colour, think the flesh colour of a banana. The more yellow or orange tones you leave in your hair the more it will affect the final hair dye result. Make sure you always try a strand test first! The colour of the dye in the tub or bottle is not always the shade you will achieve, it’s much better to test the dye results first. If you find the colour is too dark, mix in some lighter shade (or a little conditioner) to lighten it up. Alternatively, if the colour is too light, mix in a darker shade until you create the colour you are looking for. When mixing colours always add a little of the dye at a time and mix well, also make sure to mix enough of this customised colour as you will be very unlikely to create the exact same shade again – it’s always just a little off and that can be very noticeable with lighter shades. Pastel hair shades tend to fade much faster than darker more intense colours so keep in mind that you will need to reapply dye more often than with a straight forward bright colour like neon pink or deep purple. There are ways to minimise the fade of pastel shades and these range from adding a little dye to your conditioner so you top up the dye when you wash your hair, use a sulphate-free shampoo and where possible don’t wash your hair too often. Dry shampoo can be your best friend when trying to prolong your hair dye colour.